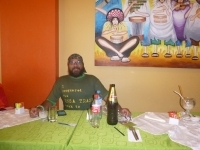 Estava muito animado para conhecer mais a Cultura Inca a nada melhor do que visitor a cidade de Cusco e fazer a Trilha Inca para mergulhar message atmosfera. Pension que seria um percurso facil mas , logo no primeiro dia ja vi que o trajeto seria dificíl. Where was the white lady ? 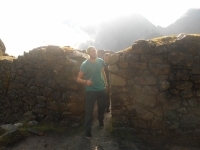 After 4 days walking on the Inca Trail, I can confess that I really don't regret my choice to did it, even if the price was quite expensive. Indeed the first day was a warm up and the two first sites are already amazing. The second was the hardest, but really not impossible. This once in a life time experience was the best I had in my life, and I mean it ! The trek was demanding but amazing and the ruins made all the way look like a road to haven. 4 days, you will meet a lot of friends, and they have very good guild, the food also good, they will provide water after first day. There were not too many Chinese people, most of people from South America, so if you can speak some Spanish, it will be very well. La experiencia fue muchísimo mejor que la esperada. Los guías nos recibieron con mucha alegría y se empezó el viaje con mucha emoción. El clima por suerte nos favoreció mucho, de noche llovía y de día estaba despejado y se podía apreciar el camino mucho mas ! Quando comecei essa aventura, acreditava ser mais fácil. Nāo imaginava que voltaria com bolhas no pė, dor no joelho, nem que os 10 km poderiam ser tāo longos e cansativos. Mas depois de quase 10.000 degraus subidos e descidos, mais de 2.000 m de altitude e falta de ar; os sítios arqueológicos compensaram todo o esforço. 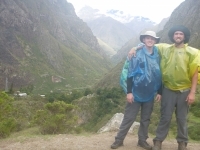 We had a wonderful adventure with Victor and the Inca Trail Reservations crew. We were treated to four amazing days of hiking, great views, excellent food, and the perfect day at Machu Picchu ! Inca Trail Reservations planned the trek perfectly and transportation, administrative and misc was all handled very well. 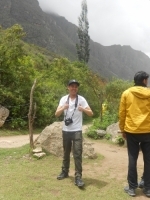 I had an amazing time with the Inca Trail Reservations tour guides, porters, and the chef was amazing. The tour guide (Victor) tried his best to make our trek as pleasant and informative as he could. Amazing guide ! 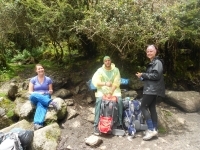 The Inca Trail was very challenging and fun ! Our guide was very knowledgeable about the trail and history of the area and was really encouraging throughout the journey. Aside from a bit of rain we had great weather and clear views of the different valleys and mountains. 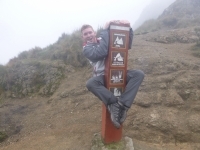 The Inca Trail is great. Very beautiful hike with some wicked elevation climbs. The food was awesome and our guide Victor was very knowledgeable, spoke very good English and was great to have him on our trek. The campsites are beautiful and the views while hiking are great.